In the morning of April 22 it was raining cats and dogs in Sorrento and I took my time getting ready in the elegant Grand Hotel La Favorita. 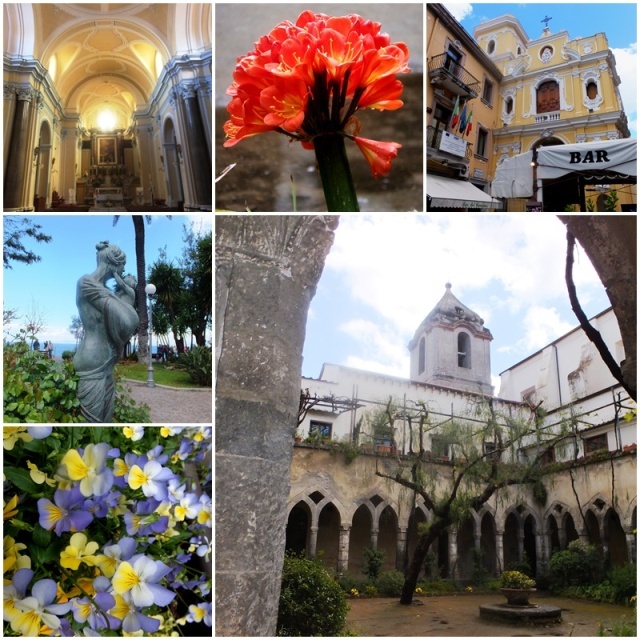 After a pleasant buffet breakfast the rain cleared up and I went for my first daytime walk in Sorrento. La Favorita is located just across the street from an attractive public square right next to the Mediterranean and it was the perfect place for me to start my explorations of the Sorrento waterfront. The ocean views from the edge of the square were absolutely fantastic. 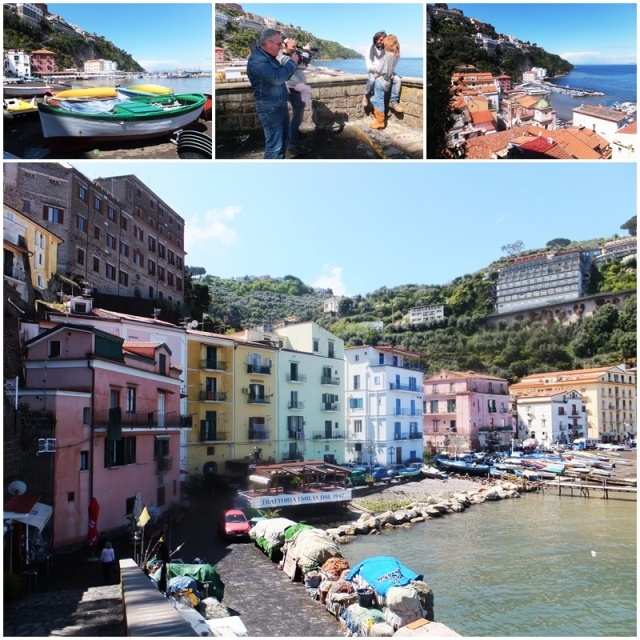 I started walking westwards, past a variety of hotels and villas and less than 15 minutes later I arrived in one of Sorrento’s most popular quarters: Marina Grande, a picturesque fishing village in the western part of Sorrento. Marina Grande is set around a small bay and features several hotels and restaurants right on the shoreline. Despite Sorrento’s popularity with international tourists, Marina Grande still has the rustic charm and laid-back quality of an ancient fishing harbor and fishing is still an active trade here. I walked back eastwards towards the centre of Sorrento and passed by the Chiostro di San Francesco, a 14th century cloister that is often used as a wedding venue. Sorrento, and the entire Amalfi Coast, is a popular wedding destination, particularly with British and American travelers. The cloister also often serves as a backdrop for art exhibitions and a home for the Sorrentine Musical Summer. Its picturesque Gothic arches surround a serene inner courtyard that evokes a mythical spirit of times long past. The church next door is full of baroque treasures and the heavy wooden portal dates back all the way to the 1500s. Next to the San Francesco Cloister is a small public park that provides a stunning lookout over the Mediterranean above the cliffs of Sorrento. An elevator takes visitors down to the beach level, but I decided to walk down to the harbor on the Via Luigi de Maio. This winding road leads downwards into a canyon-like valley that opens up to Marina Piccola, the main harbour of Sorrento. Marina Piccola is the location of both the ferry terminal and the hydrofoil terminal of Sorrento and is home to several fish restaurants. Ferries leave from here to Naples, Capri and other destinations. Sorrento has a very unique coastline, and the town is located on top of the cliff, while the waterfront is only accessible in a few spots such as at Marina Grande, Marina Piccola and, farther east, in Sant’ Agnello. After having a look around in the harbour I walked back up into town and stopped in at the Foreigners Club, a restaurant that is also the home of Sorrento Tourism . The views over the port area and the Bay of Naples from the restaurant’s terraces are truly magnificent. 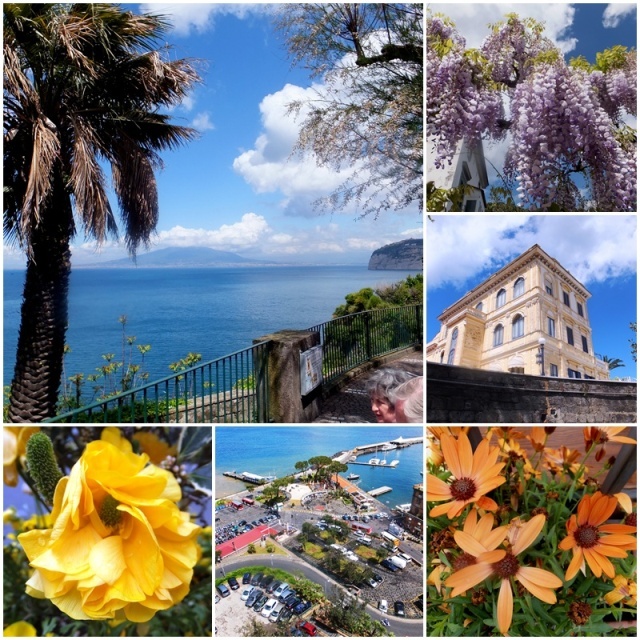 Sorrento’s gorgeous landscapes were already enjoyed by the Ancient Romans, and many emperors and aristocratic Roman families had villas here about 2000 years ago, some of which can still be visited. History abounds in Sorrento. 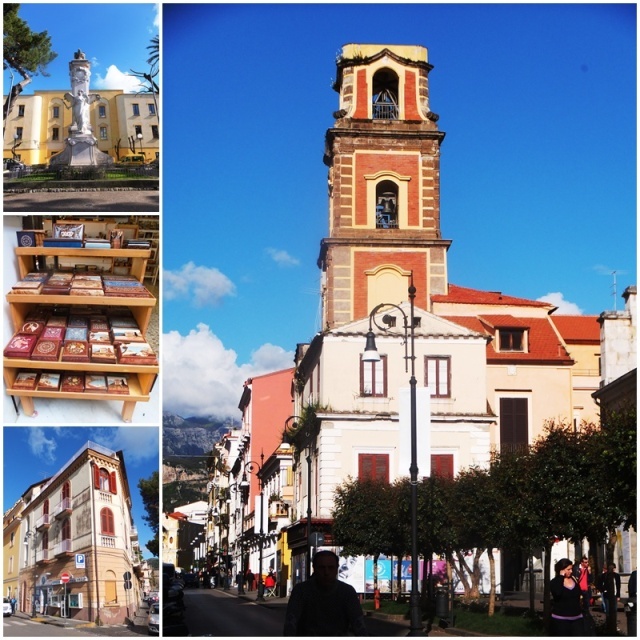 I continued my stroll to Piazza Tasso, the main square of Sorrento and its social hub. The square is lined by several restaurants and hotels with outdoor patios and is a bustling centre of activity. 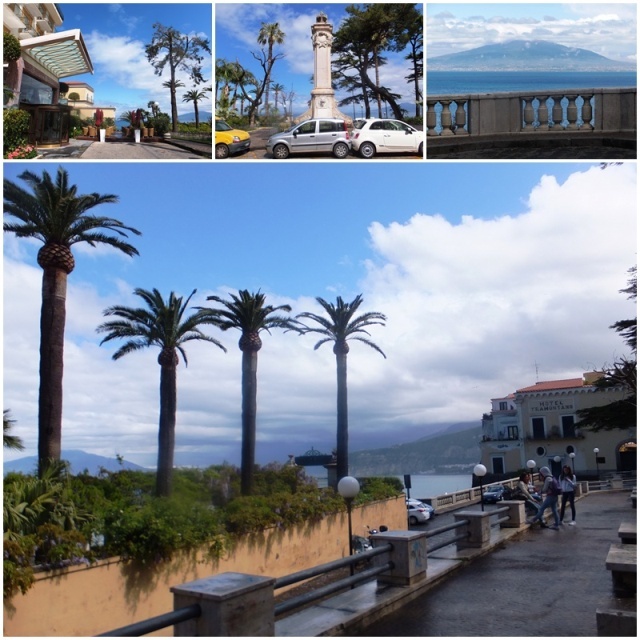 It is named after Torquato Tasso, a famous 16th century poet who was actually born in Sorrento. From this lively square, I headed into the narrow medieval alleyways of the city which are full of different shops selling everything from fruit, clothing and leather goods to local souvenirs such as lemon candy and limoncello, Sorrento’s famous lemon liqueur. In addition to shops, these narrow alleyways house many bars, gelaterias and restaurants and are a magnet for locals and tourists alike in search of an authentic Sorrento experience. 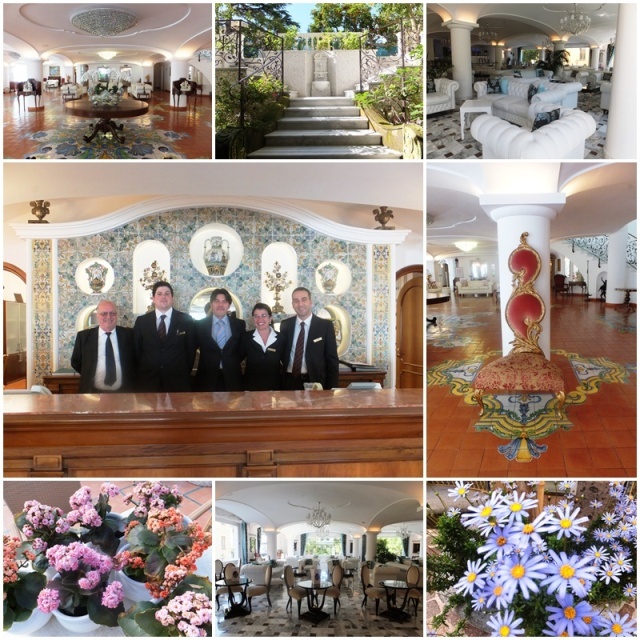 In the afternoon I returned to the Gran Hotel La Favorita and was able to get a tour of the this recently opened 4-star luxury class hotel. 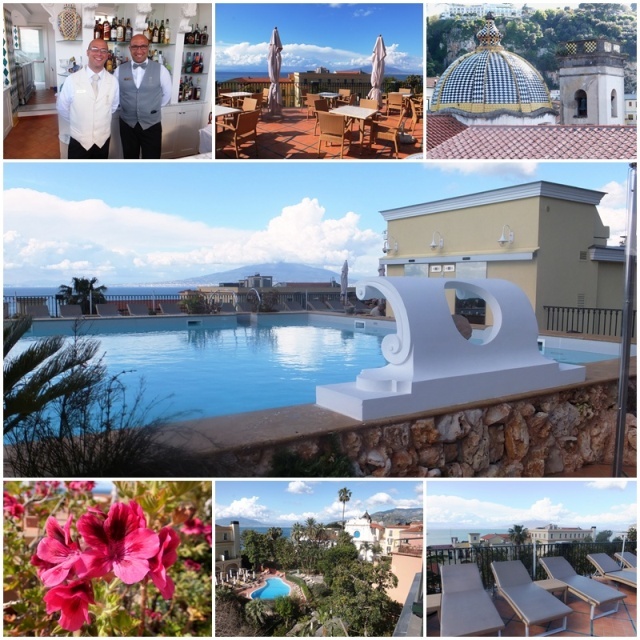 La Favorita was opened in 2010 and is the most recent upscale hotel addition in Sorrento. The hotel has a spacious and elegant reception hall, designed in a classical style with white leather furniture and white tiles that were hand painted by artisans from the village of Vietri sul Mare. Among the 85 rooms at the Gran Hotel La Favorita, there are four different room styles: classic and deluxe double rooms as well as superior double rooms and junior suites. Several of the rooms are wheelchair accessible and all of them are air conditioned and equipped with a flat screen TV, free wireless and a mini-bar. The garden of La Favorita is a serene oasis of tranquility with all sorts of colourful flowers as well as orange and lemon trees. 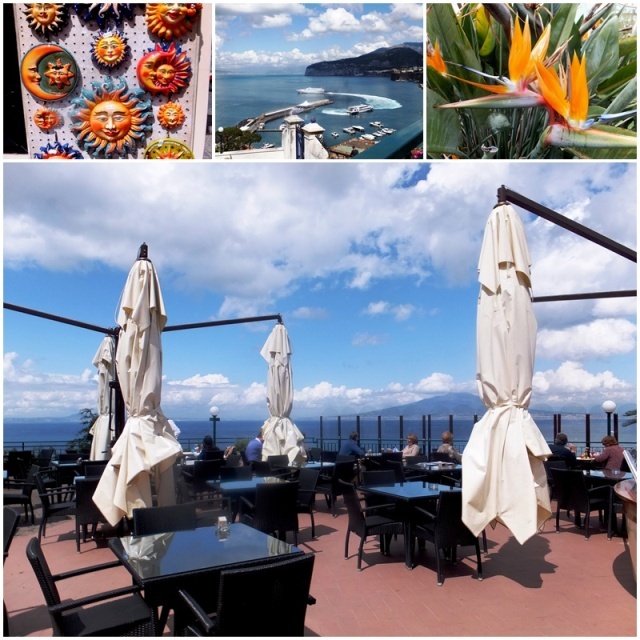 But my favourite part of the hotel was the rooftop terrace of this elegant hotel which features a swimming pool, a bar / restaurant and phenomenal views over the Mediterranean and Mount Vesuvius. La Favorita also has four different restaurants, and this evening I was going to visit “O Parrucchiano”, a historic restaurant that has been in the hotel owners’ family for several generations.